We haven’t run a Caption This in a while, and though I was saving this piece of CGI D2 fan art for a future all-furry fan art update, it’s just too good not to present on its own. 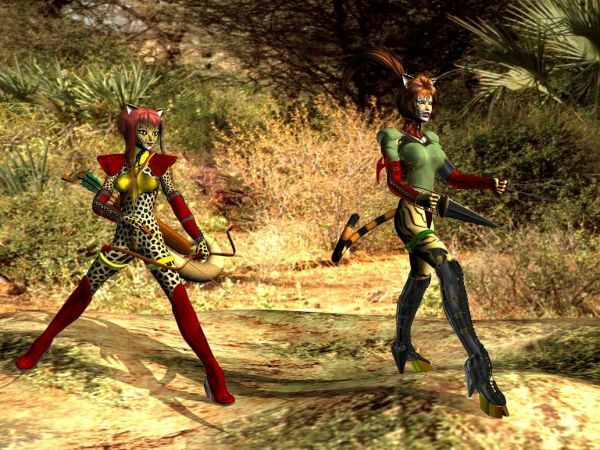 The image features feline-style furry versions of the Amazon and Assassin, in armor (of a sort) as they await the arrival of an enemy. It’s said that pictures are worth a thousand words, but I think I’d need more than 1000 to even begin to describe all the feelings and emotions this image stirs. When I first stumbled across this one some months ago, I sent the link along to Bashiok. He was rendered almost speechless, and immediately forwarded the image along to the entire Diablo III dev team, who were no doubt transfixed as well.Thus it’s not out of the question that this one image might be the cause of a good half day delay in the production of Diablo III. Take a look, ideally clicking through to see it full sized, and try to sum up your feelings with a sentence or two. Make it funny FTW, and hit the up/down vote arrows to show your appreciation of the other comments while you’re at it. The winning caption will receive the same awesome prize* as usual. I play Starcraft 2 , in no way shape or form is there any sort of innovation there. The game plays the same way it did 10 years ago but with better graphics. Big deal. I’m not saying the games won’t and are not fun but if I want something good and innovative, Blizzard games aren’t it because they keep on rehashing the same concepts over and over since day 1 of existance. So tell us all what have they done in 10 years that was so innovative/creative and warrants them to be any sort of experts to open up a teaching school ? This is all about ego and nothing more.